The Deputy Prime Minister of the Socialist Republic of Vietnam (Vietnamese : Phó Thủ tướng Cộng hòa xã hội chủ nghĩa Việt Nam), known as Deputy Chairman of the Council of Ministers (Vietnamese : Phó Chủ tịch Hội đồng Bộ trưởng) from 1981 to 1992, is one of the highest offices within the Central Government. The deputy prime minister has throughout its history been responsible for helping the prime minister to handle Vietnam's internal policies. Since Vietnam is a one-party state, with the Communist Party of Vietnam being the sole party allowed by the constitution, all the deputy prime ministers of the Democratic Republic and the Socialist Republic have been members of the party while holding office. There are currently five deputy prime ministers; Trương Hòa Bình, Phạm Bình Minh, Vũ Đức Đam, Vương Đình Huệ, and Trịnh Đình Dũng. The Government of the Socialist Republic of Vietnam is the executive arm of the Vietnamese state, and the members of the Government are elected by the National Assembly of Vietnam. The Prime Minister of Vietnam, officially styled Prime Minister of the Government of the Socialist Republic, is the head of government of Vietnam who presides over the meetings of the Central Government. The prime minister directs the work of government members, and may propose deputy prime ministers to the National Assembly. The Permanent Deputy Prime Minister of the Socialist Republic of Vietnam, known as The First Deputy Prime Minister (Vietnamese : Phó Thủ tướng Thường trực Cộng hòa xã hội chủ nghĩa Việt Nam), is a member of the Central Government and a member of the Politburo. The Permanent Deputy Prime Minister (1st) is elected and determined by the Prime Minister. The Vice President of the Socialist Republic of Vietnam, known as Deputy Chairman of the Council of State from 1981 to 1992, is the vice head of state of the Socialist Republic of Vietnam. The Vice President is appointed on the recommendation of the President to the National Assembly. The president can also recommend the vice president's dismissal and resignation from office. Upon the President's recommendation, the Vice President has to be approved by the National Assembly. The main duty of a Vice President is to help the President in discharging his duties – in certain cases, the Vice President can be empowered by the president to replace him in the discharge of some of his duties. If the president can't discharge of his duties, the Vice President becomes acting president. In case of vacancy, the vice president will remain acting president until the National Assembly elects a new president. 2. ^ These numbers are official. The "—" denotes acting deputy prime minister. The first column shows how many deputy prime ministers there have been in Vietnamese history, while the second show how many deputy prime ministers there was in that state. Phan Văn Khải was a Vietnamese politician who served as the fifth Prime Minister of the Socialist Republic of Vietnam from 25 September 1997 to 27 June 2006. The President of the Socialist Republic of Vietnam is the head of state of Vietnam. Since Vietnam is a single-party state, the President is generally considered to hold the second highest position in the political system, after the General Secretary of the Communist Party of Vietnam. In addition, the president appoints the head of government, the Prime Minister. As head of state, the President represents Vietnam both domestically and internationally, and maintains the regular and coordinated operation and stability of the national government and safeguards the independence and territorial integrity of the country. Võ Văn Kiệt was a Vietnamese politician who served as the Prime Minister of the Socialist Republic of Vietnam from 1991 to 1997. He was a well regarded Vietnamese revolutionary and political leader. He was a revolutionary veteran fighter in the long war against the French colonialists and then South Vietnamese and American forces in South Vietnam during the Vietnam War. In the difficult years following the war, he was one of the most prominent political leaders that led the innovation policy in Vietnam. He served as Prime Minister of Vietnam from 8 August 1991 to 25 September 1997, the period experienced the communist nation's return to the world arena after decades of war and isolation. The 10th National Congress of the Communist Party of Vietnam was held in Ba Đình Hall, Hanoi from 18 to 25 April 2006. The congress occurs every five years. 1,176 delegates represented the party's 3 million members. At the 13th plenum of the Central Committee, held before the congress, it was decided that eight members of the Communist Party's 9th Politburo had to retire. While certain segments within and outside the Politburo were skeptical, the decision was implemented. Because of party rules, the congress was not empowered to elect the general secretary, and it held a survey on whom the delegates wanted to be appointed General Secretary. The first plenum of the Central Committee, held in the immediate aftermath of the congress, re-elected Nông Đức Mạnh as general secretary. 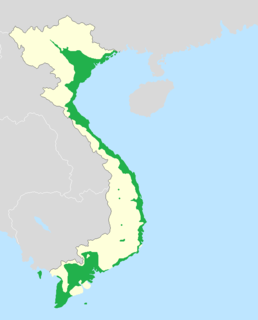 Lệ Thủy is a district of Quảng Bình Province in the North Central Coast of Vietnam. The district borders Quảng Ninh District on the north, Vĩnh Linh District on the south, Laos on the west. Lệ Thủy central is 40 km south of the provincial capital Đồng Hới. The district government seat is Kiến Giang Township. The district area is 1420.52 km2, population: 140,804 (1998). Lệ Thủy District is home to Võ Nguyên Giáp and the family of Ngô Đình Diệm. Economy bases on agriculture, mainly rice culture. Mỹ Trạch massacre by French army happened here on 29 November 1947. The Chairperson of the National Assembly of Vietnam, formerly the Chairperson of the Standing Committee of the National Assembly of Vietnam from 1946 to 1981, is the legislative speaker of the Vietnamese parliament, the National Assembly. The parliament is, in the words of the constitution, "the highest representative organ of the people; the highest organ of state power ..., the sole organ that has constitutional and legislative rights". Below is a list of Vietnamese exonyms for various cities and countries around the world. The list does not include Vietnamese-speaking areas and cities, including Vietnam itself. Cities in bold are the capital cities of their respective country. The Vietnamese exonym is after the name of the city in English. An asterisk [*] indicates a name that is still in common use. For the other countries or cities, Vietnamese people usually use the English names. Trương Tấn Sang is a Vietnamese politician, who served as the seventh President of Vietnam from 2011 to 2016. He was one of Vietnam's top leaders, alongside prime minister Nguyễn Tấn Dũng and Party general secretary Nguyễn Phú Trọng. In July 2011, Trương Tấn Sang was elected state president of the Socialist Republic of Vietnam by the National Assembly of Vietnam and nominated by his predecessor Nguyễn Minh Triết who retired from office. Lieutenant General Trần Hanh is a pilot of the Vietnam People's Air Force and later Deputy Minister of Defence of Vietnam. During the Vietnam War, Trần Hanh was a MIG-17 pilot and officer of the 921st Regiment, he shot down a F-105D in April 1965. After the war he became the Deputy Chief of the General Staff and later Deputy Minister of Defence of Vietnam before retired in 2000. The 11th Politburo of the Central Committee of the Communist Party of Vietnam was elected by the 11th Central Committee on 19 January 2011 in the aftermath of the 11th National Congress. 14-members were elected, with Trương Tấn Sang, the President of Vietnam, becoming the highest-ranked member. Of the 14 members, five of them were new to the Politburo. Nguyễn Phú Trọng, ranked eighth, was elected General Secretary of the Central Committee – as General Secretary he presides over the work of the Central Committee, the Secretariat and the Politburo. The Central Steering Committee for Anti-Corruption was directly administered by the Vietnamese Politburo and chaired by Party General Secretary Nguyễn Phú Trọng. Trương Quang Được was a senior Vietnamese politician. Despite already being a member of Vietnam's Politburo he was additionally appointed Vice-Chairman of Vietnam's National Assembly in 2003. Phạm Bình Minh is a Vietnamese politician who is currently the Minister of Foreign Affairs of the Socialist Republic of Vietnam since 2011, as well as Deputy Prime Minister since 2013. Phạm is also a member of Politburo of the Communist Party of Vietnam headed by General Secretary Nguyễn Phú Trọng. 1 2 3 Van & Cooper 1983, p. 69. ↑ Abuza, Zachary (2002). "The Lessons of Le Kha Phieu: Changing Rules in Vietnamese politics" (PDF). Contemporary Southeast Asia. 24 (1): 121–45. doi:10.1355/CS24-1H . Retrieved 27 February 2015. ↑ Koh 2008, p. 666. Koh, David (July–August 2008). "Leadership Changes at the 10th Congress of the Vietnamese Communist Party". Asian Survey . University of California Press. 48 (4): 650–672. doi:10.1525/as.2008.48.4.650. JSTOR 10.1525/as.2008.48.4.650. Van, Canh Nguyen; Cooper, Earle (1983). Vietnam under Communism, 1975–1982. Hoover Press. ISBN 9780817978518. Asian Survey is a bimonthly academic journal of Asian studies published by the University of California Press on behalf of the Institute of East Asian Studies at the University of California, Berkeley. Asian Survey provides a comprehensive retrospective of contemporary international relations within and among South, Southeast, and East Asian nations. Focused more on qualitative articles that offer new and original insights on prominent policy issues in the Asian region, rather than articles utilizing quantitative approaches, journal coverage ranges in scope from diplomacy, disarmament, missile defense, military affairs, and modernization, to ethnicity, ethnic violence, economic nationalism, general elections, and global capitalism. The journal was established in 1961 and has consistently published articles by leading American and foreign scholars. JSTOR is a digital library founded in 1995. Originally containing digitized back issues of academic journals, it now also includes books and other primary sources, and current issues of journals. It provides full-text searches of almost 2,000 journals. As of 2013, more than 8,000 institutions in more than 160 countries had access to JSTOR; most access is by subscription, but some of the site's public domain and open access content is available at no cost to anyone. JSTOR's revenue was $86 million in 2015.